Cast: Brad Pitt, Cate Blanchett, Adriana Barraza, Rinko Kikuchi, Gael Garcia Bernal, Elle Fanning. Directed by Alejandro Gonzalez Inarritu. Story: Nothing to do with a translating fish, disappointingly. Running Time: 2hrs 22 minutes. Babel contains three separate stories, linked only by the merest thread. It sounds like it could be another Crash - but it's not in the same league. Still good though. Brad Pitt and Cate Blanchett kick things off as they travel around Morocco on their holidays, strained marriage in tow. When the bus gets shot, Cate is the unfortunate random recipient of the bullet, leaving them stranded in a tiny Moroccan village with a load of English TV actors (not really, they're fellow holidaymakers, but they're all recognisable from our small screens) and miles from any kind of medical assistance. Meanwhile, their kids - at least I think that's who they are, it wasn't obvious - are being looked after by the nanny (thread two), who takes them to Mexico and then isn't allowed back across the border (oops) and on the other side of the world, the third thread sees Rinko Kikuchi as a deaf Japanese schoolgirl rebelling against her father after her mother's apparent suicide. The three stories don't tie together AT ALL, which is a major problem. It feels like we're watching three separate TV programmes, a bit at a time, and they all lack the emotional resonance that Crash has in spades. Despite unfavourable comparisons, however, Babel is actually very good. Both Rinko Kikuchi and Adriana Barraza have been nominated for Best Supporting Actress and the movie has been nominated for Best Picture, Best Director and Best Original Screenplay, and with editing and music nominations included, that's seven nominations in all, more than any other movie this year. It certainly deserves some of those, as it has some particularly moving scenes relating to the culprit of the Moroccan shooting, but I felt the other threads didn't have the chance to grow enough. This, for once, is a movie that could have carried a three hour running time - it's not often I feel a movie this long could have used more time. As for Brad Pitt and Cate Blanchett - well they're good, but it has to be said they're just other performers here - the nobodies in the cast seemed that little bit more convincing. Babel is a very good cultural movie, but not quite the masterpiece that some seem to think. There's plenty of story, but not all that much to think about, which is unusual - it's just a load of stuff that happens to people. Worth watching. 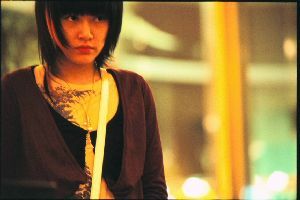 Testosterone Satisfaction Rating: 3/5 - Rinko Kikuchi (actually 26) gets her "hairy monster" out (her words) on three separate occasions. To enjoy this film you should: enjoy uncomplicated drama. Babel was released in the UK on 19th January. I have to say that this was one of the most depressing films I've seen for a long time - it keeps showing how things can go wrong and how meaningless everything is. Maybe it was worse for me having to read the subtitles for half the film in Portuguese rather than in English - it's not until you live somewhere else where they subtitle the films rather than dub them that you realise how much of the film is in a different language! I suppose it's just as well I didn't choose to see Apocolypto! Other films I've seen recently and enjoyed are Deja Vu which was surprisingly unlike what you were led to believe from the trailers, and The Prestige.